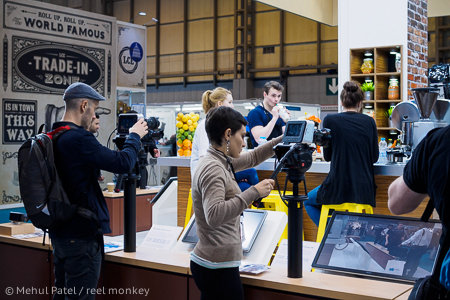 The 2015 edition of the Photography Show took place at the NEC arena in Birmingham, UK, between 21-24 March with the exhibitors and organisers providing an immersive experience for people working in or interested in photography. 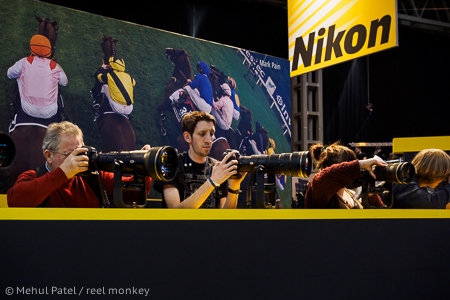 Exhibitors included all the major camera manufacturers like Canon, Nikon, Olympus, Sony, Pentax, Leica and leading publishers, retailers and photography specialists and organisations contributing to the four day fair. 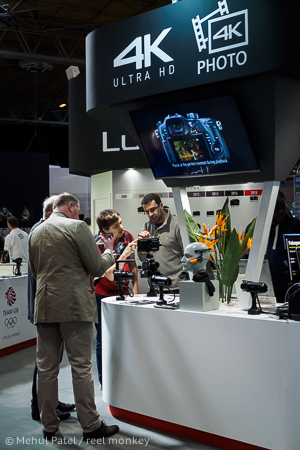 The show provided enthusiasts and professionals a wide array of opportunities to get their hands on and try out equipment, meet suppliers in the trade and attend a range of workshops, seminars, tutorials and product demonstrations. 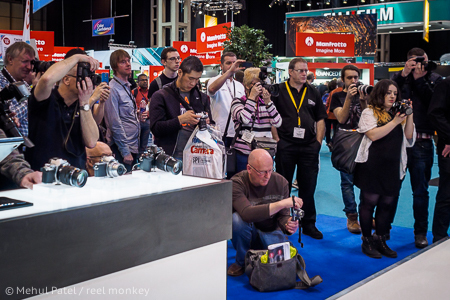 Reel Monkey attended the show earlier this week and we’ve picked out our main highlights below. 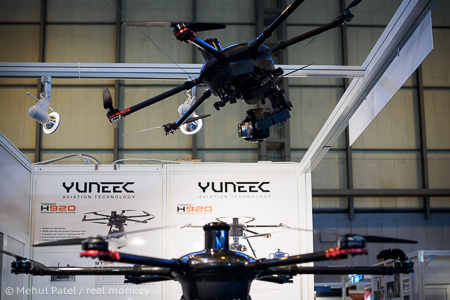 One of the dramatic additions to the world of filming and photography over the past year or two has been the use of ‘Drones’, remote controlled flying rigs with attached camera or cameras, to shoot elevated sequences or imagery in the air. 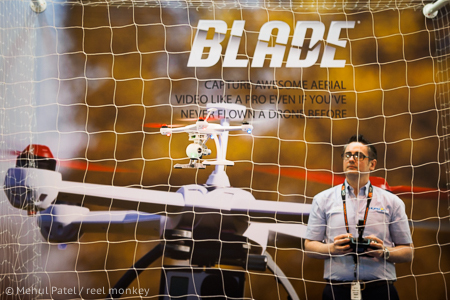 Drones have been used for covering sporting events, by film and TV productions and are becoming an increasing part of corporate and personal shooting. There were plenty of models on display at the NEC from a variety of manufacturers occupying considerable floor space at the event. There were demos galore and speakers outlining on stage to audiences the benefits and the ins and outs of working with and using drones. The evolution of 4K video or ultra HD as it is also known is gathering further pace in 2015 as the price of TV sets for consumers drop and the expansion of 4K capable cameras increases. At the Photography Show, camera manufacturers such as Sony, Canon, Panasonic and Blackmagic Design showcased their models both aimed at video professionals who shoot stills occasionally and stills professionals who would like to shoot 4K in addition to Full HD. The lines between a video specific and stills specific camera are becoming increasingly blurred though naturally for the video and the stills professional specialist looking for optimal features and quality for their field, they may still look at video and stills specific cameras. Whilst the capture and display of 4K video on TV sets has been around for a while for consumers it is only in the past year that high end 4K computer monitors have arrived for them. 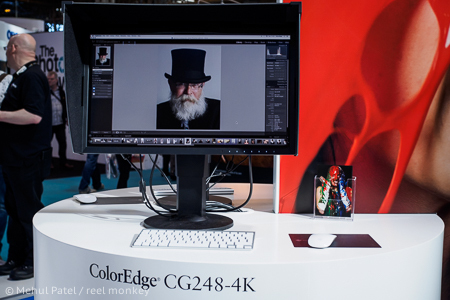 Imaging and display specialist Eizo unveiled their new 24 inch 4K model, the ColorEdge CG248-4K, at the show to add to it’s current portfolio of displays for video and stills post-production. The new model is offering the highest pixel density of 185 ppi (pixels per inch) in Eizo’s ColorEdge line up and a built-in sensor to enable self-calibration for monitor maintenance and faithful colour management. Several manufacturers displayed their new camera models for 2015 at the show with the recently announced Olympus OM-D EM-5 MkII compact system camera and the Canon 5DS and 5DS R full frame cameras two of the highlights. The Canon 5DS models are a massive pixel popping 50.6 megapixel DSLR aimed at professionals who require high detail and sharpness in their images. 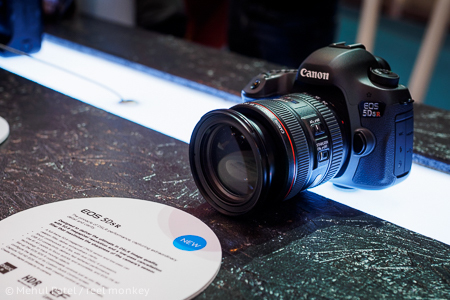 The 5DS R is thought to be ideal for landscape and architectural photography. 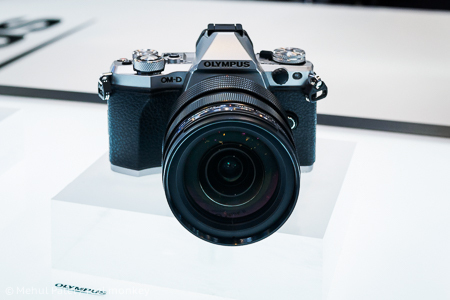 The Olympus OM-D EM-5 MkII offers a more sedate 16 megapixel sensor by comparison but is capable of capturing a whopping 40 megapixel plus high resolution image using it’s sensor shift technology which provides a detailed composite image from a series of frames, though a tripod must be used and is not suitable for capturing movement or action. The model’s improved on it’s video recording features from the original EM-5, now providing different recording frame rates – 60p, 50p, 30p, 25p, 24p at Full HD quality and better quality recording bit rates up 77Mb/s. The MkII version also boasts an improved 5-axis in-body stabilisation system to help shooting hand-held and a flip out and tiltable screen enabling better access to shoot in all types of situations. For further information about the event visit www.photographyshow.com.